Including our kids and friends in meal preparation makes mealtime so much more fun and successful (photo by LivligaHome). Today is National Food Day. There is nothing like a title that tells us we are all in this together. As I have learned and studied about healthy eating, weight management and our behavior related to changing our unhealthy habits it has become abundantly clear that it is nearly impossible to succeed in embracing a healthy lifestyle by doing it alone. The change has to be systemic. We have to involve everybody in our world from our family to our friends to our co-workers. We need to surround ourselves with a world that is supportive of good health and healthy habits. Good news is such a world is beneficial for everyone. As I have personally found, it is a world that is much more fun and joyful. I see a lot more smiles in the world I live in now. The challenge is how do we get started. For me it was all about adopting small changes and sticking to them. For some it may work better to go for broke and make major changes all at once. It can be as easy as replacing sugary sodas with flavored waters. Or you may want to right size your food environment so you tackle your food portions altogether. The only way I know you can do this successfully is to right size your dishware-- which is why I created Livliga. I have now lost almost 60 pounds, and kept it off, just by right sizing my portions and going back to actual serving sizes. Now that we have gotten started, how do we sustain the change? By making it an automatic habit. This means it has to be doable and repeatable. It also has to be enjoyable. Our attitude can make us or break us. As an example, my husband and I started eating oatmeal for breakfast about a year ago. It is just what we do. It makes preparing breakfast easy and fast. Either one of us can get it ready. It is healthy, tasty (we add dried cherries and nuts) and has helped lower our cholesterol significantly. We really enjoy this healthy habit. One or two changes does not make a healthy lifestyle so how do we keep adding more healthy habits to how we go about living our lives? We have to take on the next challenge. Sometimes, literally taking on a challenge helps us with change. Think of how many people you know who are working on being healthy who start running 5Ks. Others may eliminate different foods in their diet to help them gain more control of their health. My husband and I recently agreed to not drink alcohol during the week and just savor it on the weekends to help us control calories. Instead we are exploring various hot teas. Totally fun. My current favorite is Moroccan mint. It has become a successful new change. Being inclusive with our healthy habits and lifestyle is not only helpful to us but also to the others in our lives. 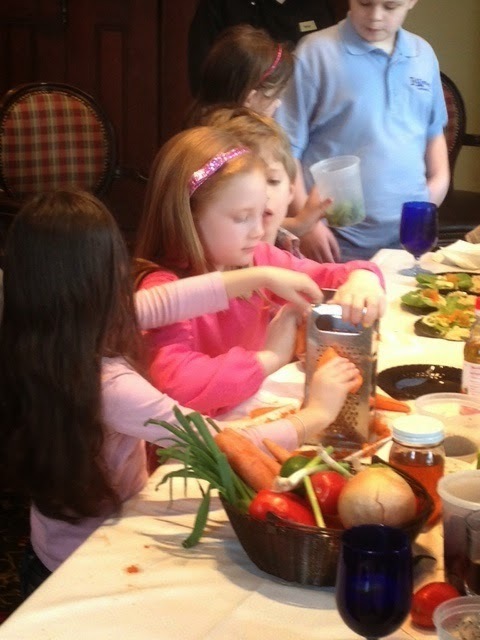 Including our kids and friends in meal preparation makes mealtime so much more fun and successful. Recent studies show that by having our kids, for instance, choose which healthy food they want to try and then letting them participate in the preparation of the meal being made they are much more likely to try new foods and like them. I came across a wonderful and informative YouTube video "Our super-sized kids" that shows how important it is to support our kids in adopting healthy habits. It also shows that successful change can only be achieved if everyone in the family gets involved. Embracing healthy eating and a healthy lifestyle is everyone's business. Let's get up and get vocal about healthy eating wherever we live and eat. We deserve it!